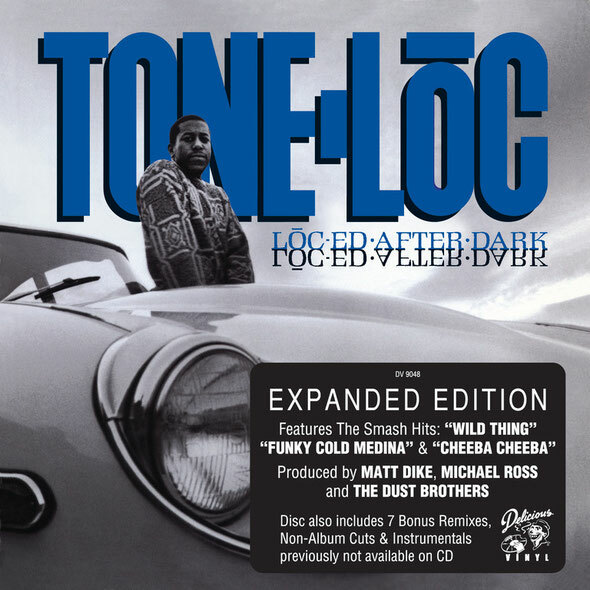 Few voices of any genre have the distinct sound quality possessed by rapper Tone Loc; match that with one of the most laid-back flows in hip hop and the result is one of the genre’s first albums to ever reach #1 on the pop charts as well as to be certified platinum. Over two decades since Tone Loc’s debut album was released in 1989, Delicious Vinyl brings you the album once again in its entirety, plus seven additional bonus tracks that include remixes and unreleased material. For a debut rap album, ‘Loc’ed After Dark’ certainly spans a wide range of styles, and with this release, listeners will be able to experience them in their fully re-mastered glory. The title track features one of the first major uses of the oft-sampled Edwin Starr track, ‘Easin In’, and does it with the deft and simplicity many of those later tracks lacked. The album also boasts early production from a pre-Beastie Boys production duo Dust Brothers on songs such as ‘Next Episode’ and ‘Don’t Get Close’, among others. Even casual hip hop listeners should enjoy rediscovering classic party jams ‘Wild Thing’ and ‘Funky Cold Medina’. As always, this brand new edition will feature detailed cover art as well as other exclusives never previously seen, adding to the enduring legacy of one of hip hop’s biggest early names.